Have you got stubborn pockets of fat that just won’t go away, no matter how hard you work out? From love handles and muffin tops to thighs that aren’t in proportion to the rest of your body. You’re not alone feeling frustrated about your body shape, but there is a solution! Tumescent liposuction is a cosmetic procedure that removes fat from the body in areas including the abdomen, thighs, upper arms, buttocks, hip and back. When you lose weight, the fat cells do not disappear – they only shrink in size. If you gain weight, the fat cells will expand again. The only proven way to eliminate fat cells is with a procedure like tumescent liposuction. It is important to note that tumescent liposuction is not a surgical procedure to help you lose weight. If you are extremely overweight, your Cosmetic Surgeon may advise you to lose some weight before having the tumescent liposuction procedure. Liposuction is a surgical technique to remove unwanted deposits of fat from specific areas of the bod. When performed by a highly trained and experienced Cosmetic Surgeon liposuction can reshape the problem areas leaving virtually no scars. Tumescent liposuction is a type of liposuction that is used by most Cosmetic Surgeons worldwide. This liposuction technique reduces blood loss and results in better healing with less bruising and discomfort. Large volumes (1 to 3 litres) of very dilute lidocaine (local anaesthetic) and epinephrine (capillary constrictor) are injected into subcutaneous fat. This solution temporarily shrinks capillaries and hardens or “tumesces” excess fat. A thin cannula is then used to suction this fat out. With any cosmetic surgery procedure, it is important to have realistic expectations about the results. Tumescent liposuction does not replace a healthy and active lifestyle. It typically has less downtime than traditional liposuction due to the smaller incision used. Once the body heals, the results are permanent – the removed fat cells will never grow back in the treated area. What types of people get tumescent liposuction? The best candidates for tumescent liposuction have a relatively normal weight but have excess fat in particular body areas. Due to inherited body shape, some people choose to have tumescent liposuction performed when they are younger. Younger skin has more elasticity and the recovery can be better, however people of all ages get tumescent liposuction surgery. Women who have had children and are concerned by the unwanted accumulations of fat that childbearing has brought including saddlebags, full thighs, hips, and a ‘pot-belly’. These areas can be resistant to healthy eating, gym workouts and exercise regimes. Men and women and men who want to improve their physical appearance and body shape. Permanently removing even a small amount of fat can make a good figure dramatically better. People who have lost a significant amount of weight but still have issues with fat areas that won’t budge, despite diet and exercise. Men who have developed love handles above the hips or accumulations of abdominal fat. This can be due to a natural decline in the production of growth hormone, which occurs with age. Men who have unwanted accumulations of fat and breast tissue over the breasts due to hereditary or other factors. To get the best tumescent liposuction results, it is important to choose a highly trained, experienced and skilled Cosmetic Surgeon who performs this procedure regularly. With any elective cosmetic surgery procedure there are possible risks and complications. We suggest you make a short list of surgeons, and have multiple consultations before you select one. Find the best Tumescent Liposuction Cosmetic Surgeons in Australia here. At your initial consultation, the Cosmetic Surgeon will examine you to assess your fat distribution and body shape. They will then advise you on what areas could be treated and how much fat can be safely removed so the final result is aesthetically pleasing. Due to the shorter recovery time and less side effects than traditional liposuction, tumescent liposuction has become more a more popular cosmetic procedure. Tumescent liposuction is performed under general anaesthetic. To avoid complications, blood tests will be taken before your procedure. It is very important to avoid taking any aspirin or anti-inflammatory medication for at least 2 weeks prior to the cosmetic procedure. Your Cosmetic Surgeon will inject several litres of a saline solution containing adrenaline and anaesthetic into the area to be suctioned. This reduces bruising and bleeding. A cannula is inserted through small incisions and connected to a powerful vacuum where the fatty tissue is removed via suction. After the tumescent liposuction procedure, to promote healing and control swelling, you will need to wear dressings and compression garments. What are the benefits of tumescent liposuction over other types of liposuction? This procedure is performed as day surgery, with generally only half a day being required at the hospital. What is recovery like after tumescent liposuction? Recovery from tumescent liposuction will vary from person to person. You will see immediate results after surgery, bruising and swelling can take some weeks to resolve. Most Cosmetic Surgeons recommend taking at least 1 week off from work and your regular routine. If you have only had a small amount of tumescent liposuction done, you may only need to take a few days off work. To prevent swelling and blood clots, it is recommended that you take regular gentle walks. Any heavy exercise or strenuous activities need to be avoided for 2 to 3 weeks. After the tumescent liposuction procedure, you will have a compression garment on 24/7. Most tumescent liposuction patients need to wear the compression garment for at least 7 days. To absorb the fluid from the incisions, there will be pads inside the compression garment. Your Cosmetic Surgeon and their team will advise you on how to change these. Are there any risks and complications with tumescent liposuction? Excessive blood loss. With today’s modern liposuction techniques, this is extremely uncommon. Cosmetic complications. If a patient is not pleased with the outcome, a ‘touch up’ procedure can be performed. This may involve having a small amount of liposuction to an area that is protruding or irregular after the initial liposuction. The final shape from tumescent liposuction will not be usually achieved for 6 months – the tissue remodelling can take up to 12 months. Patient selection. If you have poor skin elasticity, you may not be able to get the results you want. It is very important for your Cosmetic Surgeon to manage expectations as to what can and cannot be achieved with this procedure. Skin irregularities. This may be caused by over-liposuction or not enough liposuction. Skin laxity. If an area has been over-liposuctioned, it can result in a reduction of fat where the skin cannot retract over. If your skin is loose to being with, the likelihood of this happening will increase. Deep vein thrombosis. Tumescent liposuction performed under local anaesthetic has a decreased chance of causing deep vein thrombosis than if performed under general anaesthetic. Under local anaesthetic you can still use your muscles during liposuction. This helps to promote circulation and will prevent the stasis of blood. Infection after tumescent liposuction. This is extremely uncommon, because a sterile field is always maintained during the procedure. Prophylactic antibiotics are given to the patient immediately before the procedure. Patients also take these for up to a week after the procedure. In addition, the anaesthetic solution given to numb the fat is antibacterial. Read the key facts about tumescent liposuction here. I want a facelift but don’t want to look fake. 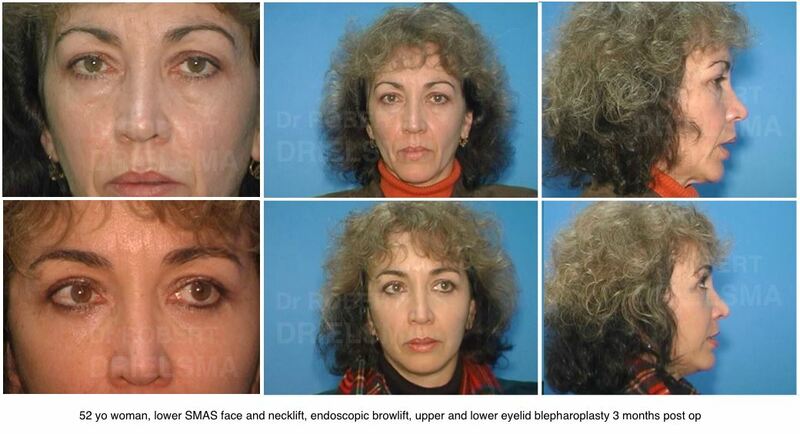 Would SMAS facelift be a good option?